Please take a moment to see all the beautiful pictures of St. Rita over at Caput Mundi. 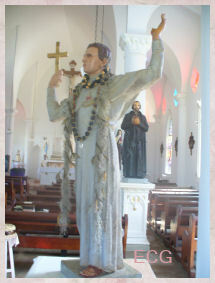 St. Cristóbal Magallanes Jara, Mexican martyr, who requested of God and the Blessed Virgin, the grace of martyrdom, for the good of the Church and of the country of your birth, pray for us. A magazine for all Catholics. A Christian satellite television network serving the Middle East and North Africa is set to significantly increase its live broadcasting thanks to support from a leading Catholic charity. Aid to the Church in Need (ACN) has given a second grant of $18,600 to provide equipment for SAT-7’s TV studio in Cairo, Egypt, enabling more live programs to be produced. 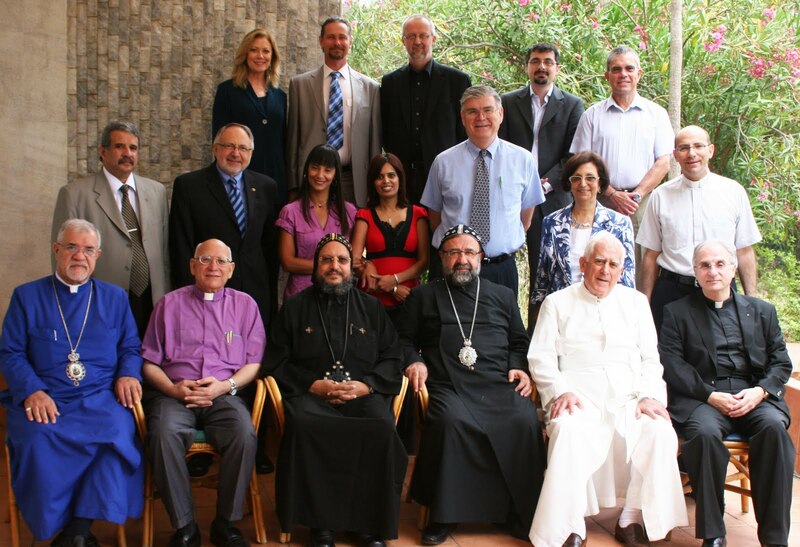 The ACN aid is expected to improve the quality of the network’s programs, which comprise news, debates, music and drama aimed at increasing understanding among Christians and closer cooperation with people of other faiths. Rachel Fadipe, Executive Director of SAT-7 in the UK, explained the importance of increasing live broadcasts. Christians from many denominations are involved in SAT-7, and clergy from different churches appear on its live programs where viewers can phone in to the studio to ask questions. SAT-7’s board draws together senior churchmen from different denominations in the region, including Catholic, Orthodox and Protestant. Satellite broadcasting is not subject to the restrictions which apply to Christian literature in some Middle Eastern countries, such as Saudi Arabia. The broadcaster also helps to build better relations between Christians and other religious groups by providing accurate information about the faith. Mr. Johansen said, “There are a lot of misunderstandings: some people believe Christians are cannibals because of Holy Communion. But when they see what’s going on, they get a different picture. In addition to the increasing number of live programs, SAT-7’s broadcasts include soap operas dealing with Christian issues and films based on Biblical subjects. 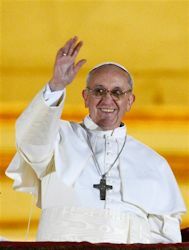 Forty percent of programs focus on teaching, catechesis and the Bible. They also include quiz shows about the Scriptures and a weekly talk by Coptic Orthodox leader Pope Shenouda III. Over the last 15 years ACN has given over $300,000 in aid to SAT-7. ACN’s recent help for the broadcaster follows Pope Benedict XVI’s 2008 message to the charity in which he encouraged it to help Christians in the Middle East and to increase its aid to broadcasting projects to support Catholic communities. SAT-7 broadcasts five channels 24-hour-a day which reach about 8 million viewers in 19 countries. 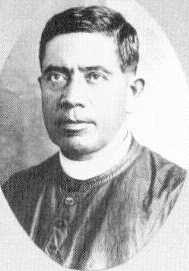 Father Thomas Frederick Price, intercede for our brother, Philip Gerard Johnson. 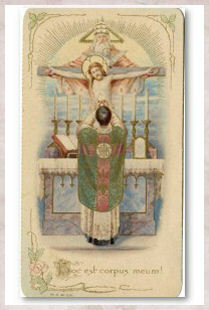 Heavenly Father, who desires that the faithful be drawn to the heroic virtues of Your priest, Fr. Thomas Frederick Price, grant Your healing gifts to Your son Philip Gerard Johnson. 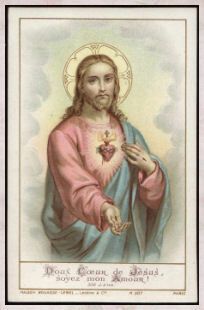 We ask this in the Holy Name of Your Son, Our Lord, Jesus Christ. Amen. The Ave Maria School of Law awarded Mother Mary Angelica, foundress of EWTN and beacon of outspoken fidelity to orthodox Catholic teaching, including on the life and family issues, an honorary law degree on Sunday. In the resolution attending the award at the school's commencement ceremonies, Ave Maria Law President and Dean Eugene R. Milhizer praised Mother Angelica as "a robust advocate for the unborn child" and "an icon in the Catholic media." 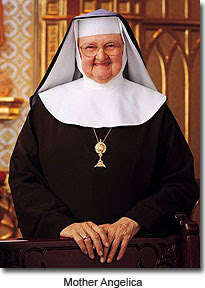 Congratulations to Mother Angelica! It is well deserved. During his general audience this morning, Benedict XVI reminisced about his recent apostolic trip to Portugal, which took place from 11 to 14 May to mark the tenth anniversary of the beatification of the shepherd children Jacinta and Francisco. 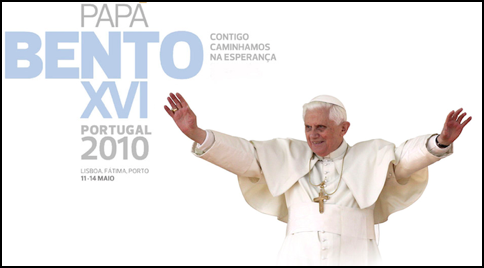 The Holy Father began by explaining how throughout his journey he had felt the "spiritual support" of his predecessor John Paul II, "who visited Fatima three times, to give thanks for the 'invisible hand' that delivered him from death in the attack of 13 May here in St. Peter's Square". One of the books I am currently reading was written by a priest a long time ago. His name was Dom Lorenzo Scupoli and the book is Spiritual Combat. It is said that the book made such an impact on Saint Francis de Sales that he carried it around with him for eighteen years. To me this book can be used as a step by step guide on achieving sanctity by being aware of our faults and overcoming them. To be able to make progress will take a huge effort on one's part. It is almost certain we will fall because of our human nature or lower Will as Dom Scupoli refers to it, overcoming the Divine Will. But we must remember to put all our trust in God and He will help us. One section of the book deals with our sins. 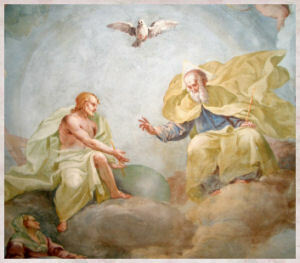 Dom Scupoli simply teaches that those who do not trust in God will run to their spiritual father (director) after realizing the gravity of their sins. But they do this more out of self-love than regret or sadness for offending God. Those who trust in God will realize that God may have permitted us to fall into sin as a way to come to the realization we are putting too much trust in ourselves and not in God. 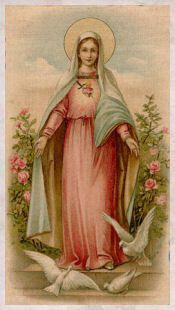 We soon realize, we do not have to strength alone to overcome the temptations which lead to sin. We must trust in God. 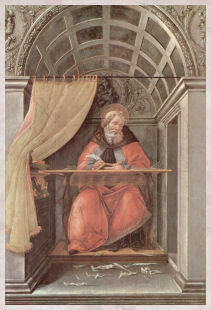 ...I wish that some persons who think themselves spiritual, who cannot, or will not, give themselves a moment's peace when they have committed a fault would well consider these things...although their first concern should be to be cleansed from the stain of their sins and to be fortified against temptation by the Most Holy Sacrament." ...The humble man knows no such experience, for his sole trust is in God. He places no reliance upon his own powers. When he falls into any fault, he is indeed sorry, but he is neither disquieted nor surprised , for he knows as the light of truth has clearly manifested to him, that the fall is the result of his own weakness and misery. I thought this was the most awesome thing I have seen in a long time. 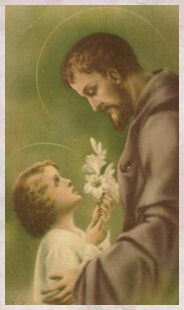 A saint's actual child being interviewed by Father Benedict Groeschel. Wow! Today would have been Pope John Paul II's birthday. Since he shares his birth date with his (and our) beloved Blessed Mother of God, I thought I would share his thoughts on motherhood. 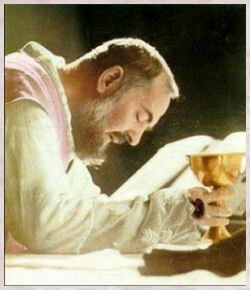 It is an eternal vocation, and it is also a contemporary vocation. 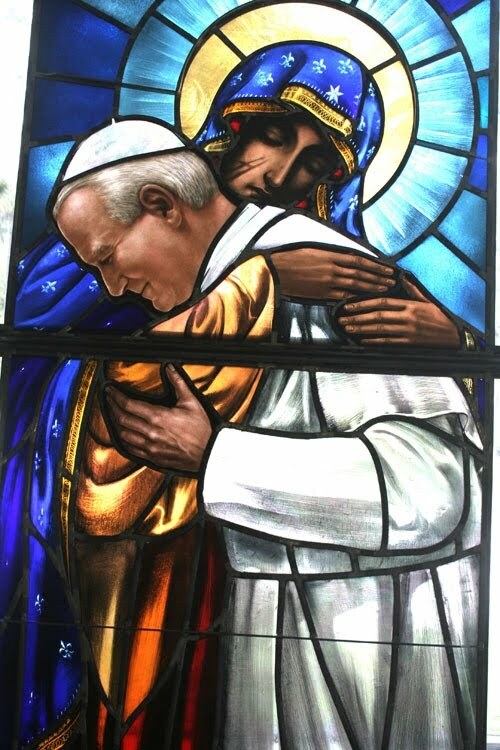 'The Mother who understands everything and embraces each of us with her heart': These are he words of a song, sung by young people in Poland, which come into my mind at this moment. The song goes on to announce that today the world is particularly 'hungry and thirsty' for that motherhood, which is woman's vocation 'physically' and 'spiritually,' as it is Mary's. Everything must be done in order that the dignity of this splendid vocation may not be broken in the inner life of a new generations; in order that the authority of the woman-mother may not be diminished in the family, social and public life, and in the whole of our civilization; in all u r contemporary legislations, in the organization of work, in publications, in the culture of everyday life, in education and in study: in every field of life." 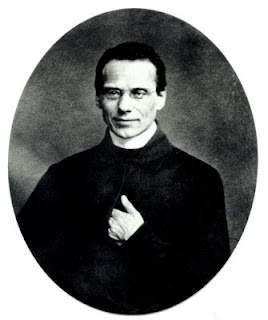 NEW ORLEANS – Joyce Bourgeois sees miracles all the time at the National Shrine of Blessed Francis Xavier Seelos where she serves as administrator. “People come from all over. Some of them come here and, if they’re ill, they feel like their case is hopeless and they come here with total despair. Then, first thing you know, we pray with them and they come back and they keep coming back,” she said. I have spoken to Joyce and her daughter on a few occasions. They are lovely people, willing to help and willing to talk story about their beloved Father Seelos. It was Joyce who shared with me stories of Father Seelos healing pets in need, as I think I have previously written about. Mahalo to MJ for sharing. 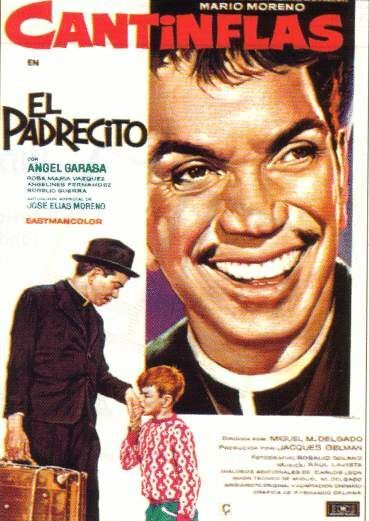 My father had a collection of movies starring Cantinflas, a favorite Mexican actor and comedian. One of the movies he had was El Padrecito. I watched it again yesterday by myself and I had a very good time with this funny movie. It is about a young priest right out of the seminary, who is sent to help an old priest at a parish. The old priest is convinced the young priest is going to become the new pastor and he is not happy at all. He feels he will die if he is forced to leave his beloved parish. 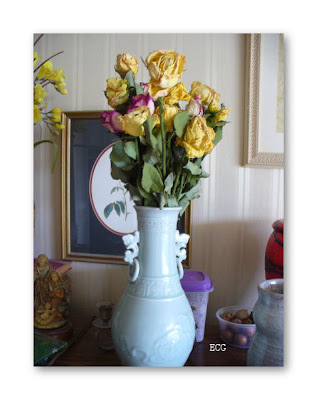 The older priest's sister and niece live with him at the rectory. The sister is determine to make the young priest's life miserable in a misguided loyalty to her brother. 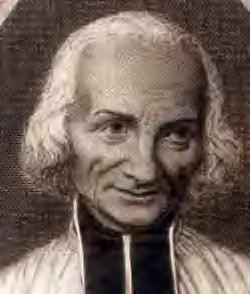 The older priest and the sister are not the only ones who do not want the young priest to stay. The town's rich man, who happens to be an atheist, has selfish reasons for not wanting the young priest to remain. He also has plans to rid himself of this interloper. But little did they know that this new priest is a force to be reckoned with and he does so with humor and wit, not to mention his gambling and bull fighting skills. There are other subplots involving El Padrecito's withholding of certain sacraments because of the individuals not being really prepared...for example, the penitent, the engaged couple, the parents wanting to have their child baptized. I do not want to give away the funny parts so I have to stop here. The movies is available with English subtitles. The following is a clip of El Padrecito playing the Ave Maria on the organ. 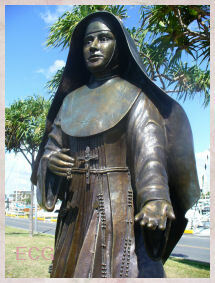 The Image above consist of Rosaries made by the laity for Priests of the Diocese of Honolulu . Most Rev. 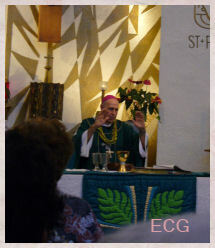 Bishop Larry Silva blessed them on Oct. 12, 2007. The project was sponsored by Serra Club of Honolulu. 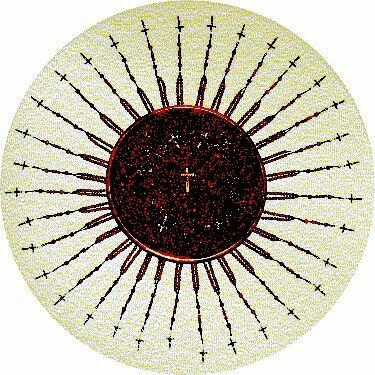 The Image shows 30 crucifixes (center), 33 rays symbolizing the importance of Adoration (Monstrance), Holy Eucharist, and Prayers for Priests. 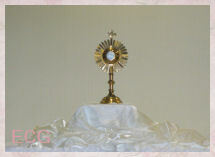 It reflects our unity in suffering, joys and light to the world as the Mystical Body of Christ. 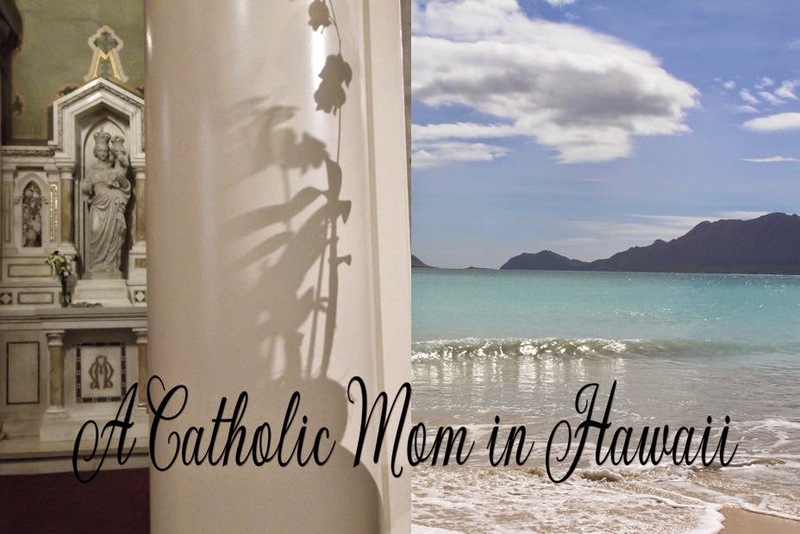 Catholics throughout the Diocese of Honolulu are encouraged to come as the Body of Christ. A SPIRITUAL BOUQUET OF PRAYERS & GOOD WORKS FOR OUR PRIESTS & SEMINARIANS IS REQUESTED. Please see pledge paper at back of your church. Turn in your pledges with your lay group or bring on June 3rd for collection. Outer islands / faithful who cannot attend but will pray, please send your pledge to any of the emails below. Sponsored by SERRA CLUB OF HONOLULU.